This is part two of our post about Marrakech! Quick reminder, you will find the complete set at my Facebook page reachable through a link on the right part of the blog. Do you know why all houses in Marrakech are covered with this red/orange coating? It apparently is because, far from the coast the air charged with dust tends to dirt houses traditionally painted in white. The houses colour matches with the earth colour you would find in Moroccan landscape at the feet of the high Atlas. And this is precisely where we will drive to for our first picture! This was taken at wide angle directly against the sun and with a pretty high colour temperature setting. I took a chance on clicking in order to get this contrasting red bottle in the foreground and got it as a microsecond later would have been too late and the image would have been much less balanced in my opinion. This red bottle highlights the presence of one individual goal through that mass. It shows that despite the apparent chaos, everyone is here for a very practical reason. Needless to say, it also balances composition by offering an focal point to the viewer’s eye! Monday is Berbere’s market day. At about one hour drive from Marrakech, people would come down the Atlas with family and donkeys (no joke) and gather near a small village to buy essential goods like salt, meat, mint and tea but also to give a visit to the dozen Barber/Dentists who for a couple of Coins will shave you and extract your teeth with terribly rusty tools… The old dude I’ve seen on the chair seemed happy with the service provided… This photo above is a sort of Donkey parking lot where farmers would leave the animal the time of the ballade through the tents. It was about 11am and the ambiance was pretty bubbly as it seemed to be a last chance to get a sheep for the Aid El-Adha’s sacrifice. Believe it or not but camera around the neck, being probably the only tourist there, this is the sole picture I took… Why? First because it was insanely busy and tricky to navigate through the mass of people, animals and cars. Second because once again, take a picture of someone and they will ask you for money (how about introducing the TFP concept?). Last but not least, it looked beautiful colour wise and pattern wise but any picture I would take would have fallen into stereotypic miserabilist representations. I was far too overwhelmed and excited to concentrate to avoid this and simply preferred to enjoy the scenery with my own senses. And believe me it’s difficult not to be overwhelmed in Marrakech! For those of you who never had the chance to experience the muezzin call for prayer it can be quite a shock when first time hearing it. It sounds like nothing I ever heard before. 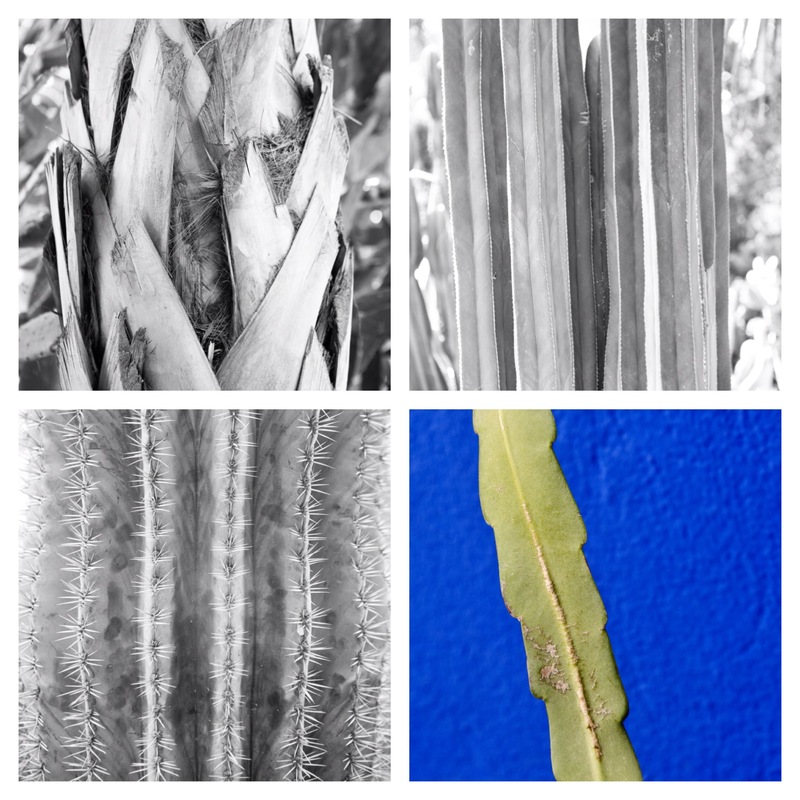 It quickly came as a priority for me to find a way to represent this “call” visually through my photos. I wanted to translate this feeling of god talking to the people via the Mosque medium. 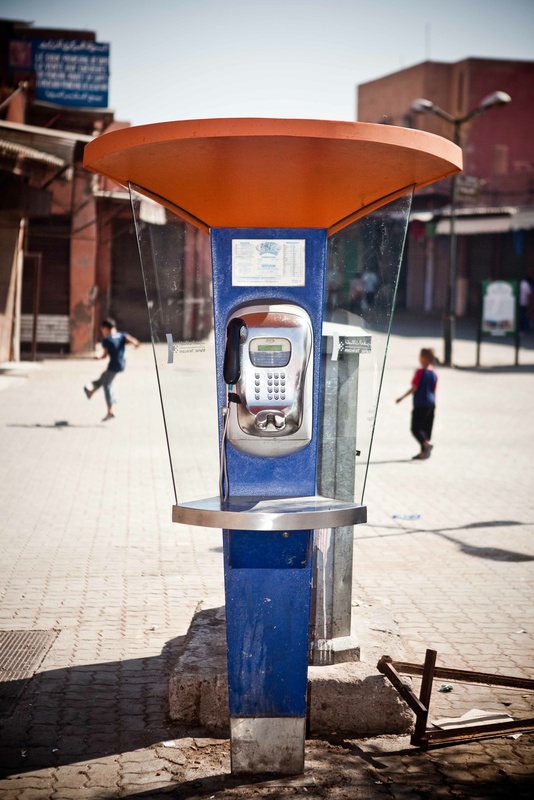 The call can be heard from ANYWHERE in the city, five time a day in tune with the Sun movements (Moroccan flag is a five star branch, symbolising those five prayers). Picturing the Koutoubia, largest Mosque in Marrakech and highest point in the skyline for urbanism reasons seemed logical. 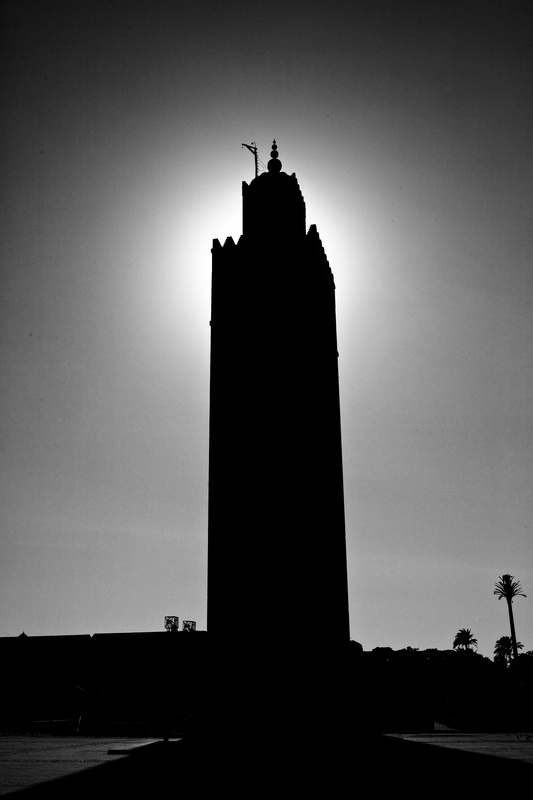 I the above picture I wanted to visually demonstrate this relationship between god (the sun), the mosque tower grabbing it and communicating it to the ground of Marrakech. This was done by exposing the sky correctly and therefore burning most of the details for obtaining a contrast between divine clarity and human constructions. 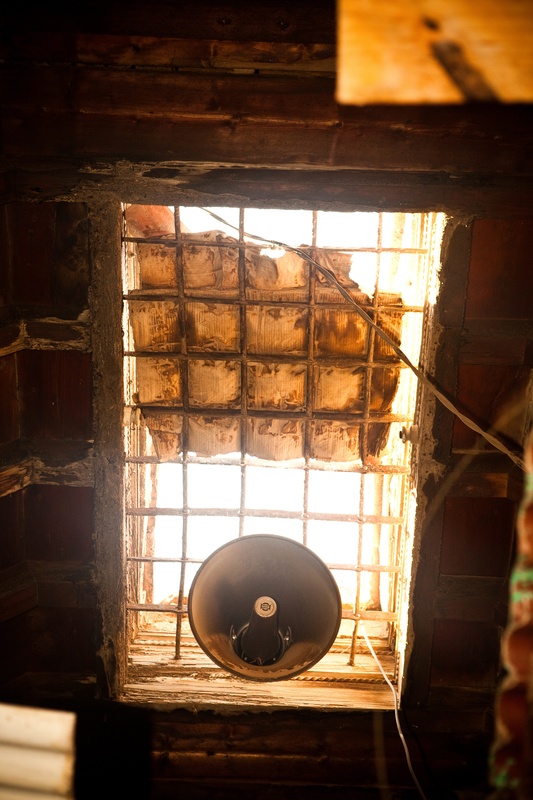 In the picture above, another example shows a speaker stocked on a window in the Souks roof bringing both light from the sky and light of god through the prayers in the dark shadowy grounds of this market dedicated neighbourhood. 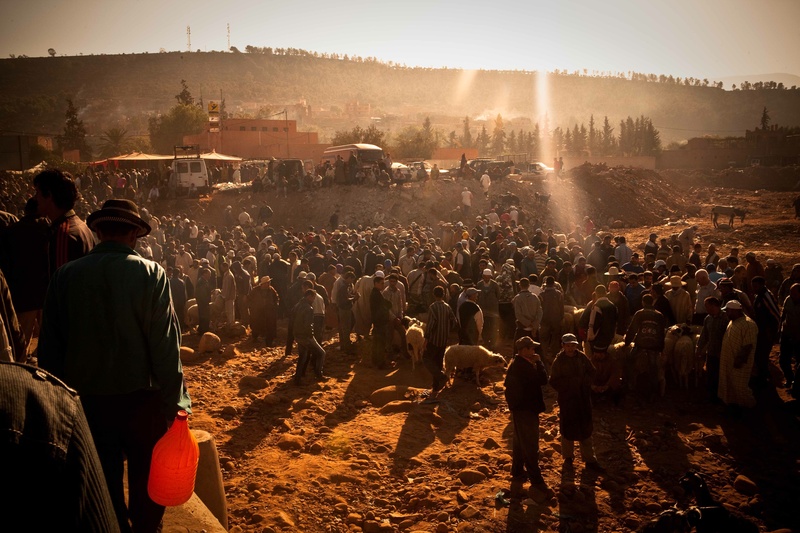 This shot below shows two boys playing with a balloon in a souks place under a heavy afternoon sun. I popped my flash to obtain details in this colourful public typical telephone one can see everywhere in the city. This spot had it all to me: chaotic souks architecture and picturesque constructions, colours and contrasts, bright sun and effervescent young people. A proper postal card with a modern representational twist! Finally I just wanted to share this small composition with you done in jardins de Majorelle where Yves Saint Laurent would now rest in piece. Just a nice mix of pattern don’t you think so?